With the severe health risks associated with asbestos fibres now well documented, many industries are looking for a suitable asbestos substitute when it comes to fire protection. What they require is a material that will be both temperature resistant but also sufficiently strong. Elmelin takes a multi-faceted, innovative approach to supporting fire protection with its product range. We provide solutions for heat resistant materials that will do the job of asbestos but with a significantly improved safety capacity. Combined mica and microporous insulation products have significant fire protection capabilities and applications, making them an ideal asbestos substitute, which many industries prefer. Our Elmtherm product range’s thermal insulation and heat resistant properties mean it works in a variety of situations where fire protection is a necessity, and a priority. Heat shields are widely used in automotive and aerospace industries. With vehicles, internal combustion engines give off large, intense amounts of heat. Therefore, it is crucial to protect components and bodywork from heat damage. Using Elmtherm as a thermal barrier, automotive heat shields improve insulation, and can help to cool engine mount vents and improve exhaust heat management. Heat shields also have industrial applications, as rigid protection for equipment where there is the risk of fire damage. Microtechnology has broadened the possibilities for high performance insulation, while raising standards of fire protection. Fire doors are essential passive fire protection devices, effectively dividing buildings into fire-resistant compartments. They can significantly increase the chances of evacuation, and survival, of anyone in the building. However, to be effective fire doors must be fire-resistant, and able to withstand intense heat. With the right degree of resistance, fire doors can cause a fire to burn itself out without spreading by completely containing it. Fire doors can also help preserve the structural integrity of a building that is on fire, so that it is less likely to collapse. It is therefore essential that fire doors comprise the kind of materials that will ensure this level of performance. Microporous insulation boards provide a combination of effective fire proofing with lightweight composition and simplicity of design. Applied to fire doors, they offer clear advantages in fire protection. Fire resistance for lift landing doors should be a vital part of any building’s fire protection policy. 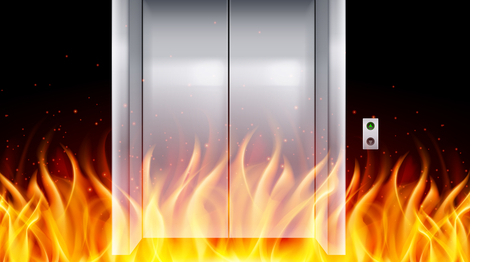 Lift shafts and lift lobbies can present fire risk situations. Elmelin’s fire protection product development extends to insulation for lift landing doors, ensuring they can act as effective fire barriers in the event of a fire. Contact us today to find out how we can help and support you.